From statement pieces to timeless classics, an extraordinary pair of earrings can elevate any fashion choice. 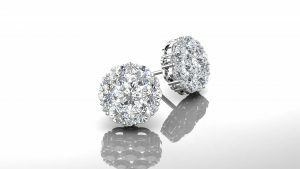 If you’re looking to explore the latest trends in diamond stud earrings and hoop earrings, you’ll find them at the Jewelry Design Gallery in Manalapan NJ. We have the widest selection on display or we can customize design a pair that will be exclusively and undeniably your style. While hoop earrings continue to be a lasting favorite, diamond stud earrings are also a classic choice. For over 30 years, our full-service jewelry store has offered everything from the exotic to the elegant, staying ahead of the trends with a fashion-forward selection of dangling, hugging, climbing, and drop earrings. The highest-grade diamonds accompanied by a certification from the most reputable and respected grading laboratories: The Gemological Institute of America (GIA), the American Gem Society (AGS) and the European Gemological Laboratories. If you’d like to create a custom pair of diamond hoop earrings or you’re looking to find the perfect pair of drop earrings, visit our store for a personalized experience or schedule an appointment at 732-536-1184.